Don't just become another makeup artist with a certificate of little value! Become a Supercover Professional HD Make-up Artist accredited by the professional body in the beauty industry ABT (Association of Beauty Therapists). Our philosophy and objective is to train you to become a well rounded High Definition (HD) make-up artist using film and television makeup techniques which will allow you to use these HD professional skills and recognised accredited qualifications to practice as a career in HD make-up for bridal, photographic, media, magazine shoots, catwalk, news casters, actors and for a salon. The three "P's", "passion", "personality" and "positive" attitude is all that is needed as an entrance to our accredited Institute of Make-up Artistry courses. Our past students have been experienced Make-up Artists, College Lecturers and some have gone on to show their talents on television, film, photo shoots, theatres, back stage music shows and magazine shoots. The College Tutors and Make-up Artists have found the courses to be of the highest possible standards for today's technology and cultural makeup. At the Supercover Professional HD Institute of Make-up Artistry we are committed to your development and when you choose to learn from us our support does not stop there. We like you to keep us informed of your progress and if need be we will happily offer professional advice as well as refresher sessions. We keep a keen eye out for students who do extremely well. Those showing enthusiasm, talent, and dedication will be offered the opportunity to work with us in the future. Day 3: Further practical catwalk, media / magazine, ( ageing and men's make-up techniques optional ). Our class sizes are kept small to maximise learning and to ensure you receive the highest level of attention and one to one training from our tutors for HD make-up. Our venue is based in Bromley with a dedicated make-up room with mirrors and plenty of space for learning. Supercovers Professional HD Advanced Level Course Award Certificate is certified by ABT (Association of Beauty Therapists). We provide all the make-up products on the day of the course. We also provide a variety of make-up kits letting you choose what make-up kit suits you best. 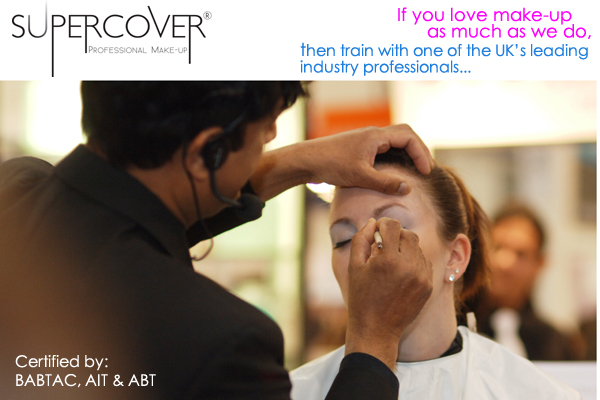 During the course students can take advantage of the Supercover Professional Make-up range at discounted prices. Our 1-Day Course is GBP 400 (plus. VAT) £480 including vat. Our 3-Day Course is GBP 1,200 (plus. VAT) Pound Sterling. I want to learn, sign me up! To reserve and pay for your course fees please call 01273 878 100. Payment can be made by Credit or Debit Card four weeks in advance to class dates. Upon receiving full payment an email will be confirmed to you, with your class dates, full address and other important information. THE VENUE FOR THE CLASS: BROMLEY, KENT. BR2 0BB. Please call Zaf to discuss your course dates on 01273 878 100. You will be required to bring your own model for your practical days which are the 2nd and 3rd day of the class. We do not provide models. If you are doing a one day course then you need to bring a model for the whole day. All make-up products, tools, etc. are supplied for the practical sessions, therefore, you do not need to bring these except for false lashes and glue should you wish to learn how to apply these. Bring a pad and pen, a camera to record your work and a packed lunch if you wish. Video filming is not permitted. You may select a subject such as Asian bridal HD make-up or other subjects on a one day course. You are welcome to bring a professional photographer or your own camera for a photo shoot as part of your portfolio. For this we would suggest that you bring all the necessary items including articles of clothing.